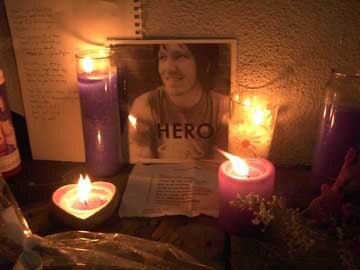 'Elliott's family has established a trust and any monetary donations should be sent to the 'Elliott Smith Memorial Fund.' If you would like to make a donation via paypal, please send it to esmfund@yahoo.com. This email address is set up exclusively for the paypal account so any emails sent to it will probably go unanswered. Thank you. The Elliott Smith Memorial Fund is a not-for-profit organization being established by Elliott's family for the sole purpose of providing financial support for children who are victims of abuse. Although it is still in the process of being organized, the Elliott Smith Memorial Fund will be registered as a not-for-profit entity pursuant to Section 501(c)(3) of the Internal Revenue Code. The Elliott Smith Memorial Fund is the only organization authorized by Elliott's family to carry out his charitable wishes, and his family is not at this time associated with any other fund or foundation. you can also send any letters or anything to the family to the address above as well. statement from spaceland: want everybody to know we never imagined the response would be so amazing, and we could not secure a larger venue in the time we had. This was originally going to be a private event at either Spaceland or Echo (300 capacity), but the decision was made to make it open to the public and the Fonda was the easiest to secure. The response was overwhelming, and because of time we were not able to move the show. Everybody involved in this is doing it for Elliott, I hope everybody realizes that and knows that attending is not the only way they can show their love/support/sadness/anger/happiness/gratitude etc for this person we all above all respected. 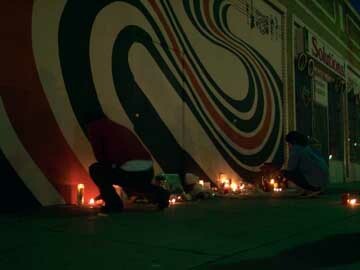 Elliott Smith Foundation for Abused Children. Doors are at 6pm and all ages are welcome. The Henry Fonda Theatre is located at 6126 Hollywood Blvd. in Hollywood, CA (323) 464-0808. Queen/Strachan-Trinity). Joel has supplied a map and directions (above) to help you arrive. 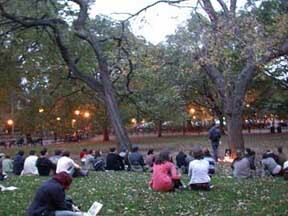 As at the NYC memorial, you are welcome to arrive at any time; earlier or later, to stay for a while or to simply drop by and leave pictures, letters, candles, thoughts and any other fond farewells. Binging a guitar would be lovely. I hope to see you there. Take care and dress warmly, it's getting cooler these days. kcrw tribute show on new ground. click here to check it out. its wonderful! im sorry i delete the email for who sent these pics and i forgot the name. sigh :( they are from the nyc vigil. thank you. hi everyone. i just wanted to thank everyone for all the love and support you have given to elliott, elliott's loved ones, family, friends, each other and me. its been overwhelming how much love is out there all around. its an amazing thing. thank you to everyone who has posted something on websites too. i just wanted to thank also solutions on sunset blvd. for letting fans go by and pay their respects. seeing the pictures, we appreciate it so much. i'm sorry i havent been able to even respond or even read all the emails that have been sent. i did/doing my best and i hope to email each and everyone of you at some point just to thank you. no word about sending flowers or anything in behalf of elliott. if anything comes up, i'll for sure post it. i just wanted to let you know that sweet adeline will be back on friday or saturday. hopefully it will help all of us to play some tabs or look around. also the site will be around for a very long time in memory of elliott. i wish i could organize everything to post meet ups and memorials. please check sweetaddy.com. sorry i cant with my email system. i pray you are all ok at this time. sorry to all the media requests too. as you probably realize im pretty devastated about having to say goodbye to elliott. i've been so lucky enough to experience my own love and other's love of elliott and what his music has brought to us. its never easy to put into words what someone means to you. simply elliott was such a lovely man. i'll miss him so much. he was so kind and generous. he really made me feel so good whether being in his presence or watching him play a song or just driving in my car singing along. when i first meet elliott in 1998 after a show i was really worried to bug him for an autograph. it seemed like every article i read, elliott got into a fight somehow, so my perception was that you don't want to get him mad because you might get socked. well i was willing to take a chance that night and god i'm so glad i did. it was brief but it meant the world. with elliott holding a beer, i ran up to him asking for an autograph. with a soft spoken yes and a smile, he was willing to take time for me to sign my record. the fact he was willing to take time to do that for me meant the world. not only didn't i get socked but elliott put 'to charlie <3 elliott' of course that just made me love him more :) as time went on, i got to meet elliott more and more and spend a little time with him backstage. as always he was sweet to me before even knowing who i was. but finally i told him. i was nervous but he was so comforting. he even gave me a pat on the back. some of the things he told me were cool, interesting, honest and funny. the best moment to me was when he told me how much he loved the site. the thing is that it reflects on everyone who contributed to the site and visited the site. elliott told me he thought the site was really nice and that he would come and visit it especially to check out the set lists to see what he played before so he could play a new set. he thanked me for it but really he was thanking everyone because he appreciated how much everyone cared about what he was doing. he also thanked us multiple times! so many times people close to elliott thanked us for doing this for elliott too because they knew how much it meant to him. you guys really did make him happy and brought a lot of good to his life. as fans gave to him, he was willing to give too. all the stories i read and heard from fans were never negative. everyone's experience with elliott was always positive. from elliott putting fans who didn't get tickets for the show on his guest list to giving money to the homeless to simply hanging out with fans and going out for a beer. i wish i could put so much more because that just doesn't add to all the kind things he was willing to do for anyone. i wish i could remember everyone's stories and list them all for you. i wish i knew every word he said to me word for word to share with you. im sorry i wish i could say more. im sad. so how can you say goodbye to someone who was and is so wonderful? you don't because elliott will be forever in my heart and hopefully yours. i will always have his love, kindness, intelligence, humbleness, creativeness, greatness and so much more in me forever because that's what he was and i'll always love him for being who he was. i love you so much elliott. thank you so much from the bottom of my heart and soul for making me happy when i need it or i just wanted to rock out. thank you for bringing such much joy to your love ones, family, your friends and all of us. i really pray you heard all the great things you gave us. love and friends. i'll miss you so much. we will all miss you. see you in heaven elliott. Steven Paul (Elliott) Smith. August 6, 1969 – October 21, 2003. 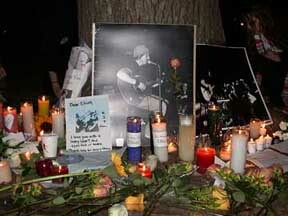 Elliott Smith was born on August 6, 1969 in Omaha, Nebraska. Elliott spent his childhood near Dallas, Texas where he began his musical training at the age of nine, winning a local award for original composition at the age of ten. Elliott relocated to Portland, Oregon as a Sophomore at Lincoln High School where he achieved the rank of National Merit Scholar. During his time at Lincoln High School, Elliott joined the band “Stranger Than Fiction” in which he composed music and performed until his graduation in 1987. Elliott later attended Hampshire College in Amherst, Massachusetts, where he majored in Philosophy and Political Science. During his time at Hampshire, Elliott, known then as Elliott Stillwater-Rotter, co-founded the band “A Murder of Crows”. He later became a member of well known band “Heatmiser”. It was during this time that Elliott began to release music as a solo artist. During his lifetime, Elliott released five full-length albums as a solo artist as well as a number of singles. Elliott was nominated for an Academy Award for “Miss Misery”, his musical contribution to the Academy Award winning movie, “Good Will Hunting”. At the time of his death, Elliott was recording his sixth album, “From A Basement On The Hill”. Elliott is survived by a host of family, friends and fans. thanks to odie for posting that they got the new dvd of steve hanft's film, southlander which includes a cameo by elliott. odie mentioned that it also includes a couple of unreleased/full length elliott smith recordings. the first one is splitsville which you can hear a small clip of on the southlander official site under the soundtrack link. the dvd includes the whole song when the credits role. the other song is an instrumental called snowbunny's serenade and is described by biaatch in the 'ask charlie a question' section as a slow version of bye from figure 8. the dvd is now available and if you want to get it for a reasonable price, check here.